‘VRINDA-Vasant Sahaniwas,’ a residential scheme run by Aditya-Anagha celebrated its first foundation day on the occasion of Gudhi Padwa with a mesmerising musical programme ‘Swar-Swagat’. Super hit Hindi and Marathi songs programme was organised at Vrinda-Vasant Sahanivas premises, Narayan Nagar, Waddhamana. Noted singer Surabhi Dhomne, Amar Kulkarni, Vinod Vakhare and Sagar Madhumatke, known as voice of Kishore Kumar made the Hindu New Year Day memorable for the audience. Hit songs both Hindi and Marathi made the audience spell-bound. 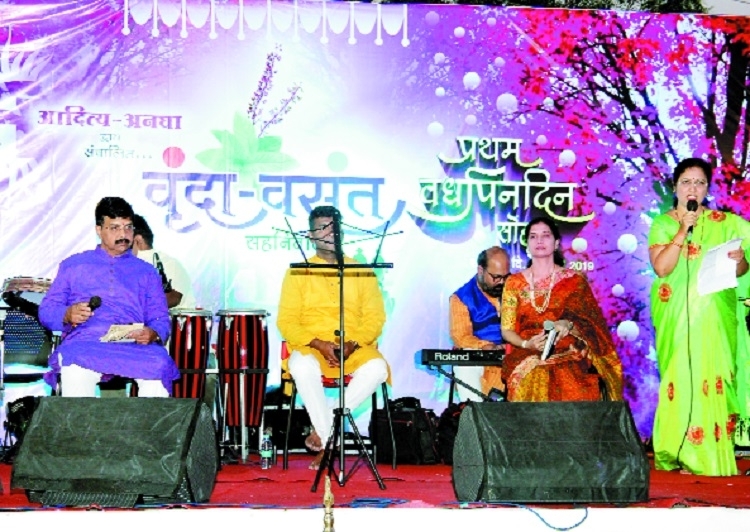 Vinod Vakhare and Amar Kulkarni presented songs from ‘Geet Ramayan’. Smitha Khangan compered the programme. Present were Anagha Saraf, founder and Chairperson of Aditya-Anagha and directors.